Have you wondered just what a medieval king did on a typical day? We actually do have an account of what it was like for King Charles V of France, thanks to Christine de Pizan. Around the year 1404 Christine de Pizan finished her work, Livre des faits et bonnes mœurs du sage roy Charles V, which was both a biography of the French king who reigned from 1364 to 1380, and a guide to how an ideal monarch should live and rule. Christine had a good vantage point to tell this story – her father, Tommaso di Pizano, was a personal physician and astrologer at Charles’ court, so one can assume that she was sometimes at the court herself. Moreover, in later years she was able to consult other men and women who served the king, including his chamberlain and valet. When he had been combed, dressed, and outfitted according to the demands of the day’s program, his chaplain, a distinguished person and honourable priest, brought him his breviary and helped him to say his hours, according to the canonical day of the calendar. Around eight o’clock he would go to mass, which was celebrated each day with glorious, solemn singing. As he came out of the chapel, all sorts of people, rich or poor, ladies or maidens, widows or others who had problems, could make their petitions to him and he very kindly would pause to listen to their supplications, responding charitably to those that were reasonable or piteous. More doubtful cases he turned over to some master of requests to examine. After this, on appointed days, he would meet with his council, and then with some nobleman of his own blood or some clergymen who happened to be present. If some particular lengthy business did not prevent him, he would go to the table around ten o’clock. His meal was not long, for he did not favor elaborate food, saying that such food bothered his stomach and disturbed his memory. He drank clear and simple wine, light in color, well cut, and not much quantity nor great variety. Like David, to rejoice his spirits, he listened willingly at the end of his meal to stringed instruments playing the sweetest possible music. There one might find several kinds of foreign ambassadors, noblemen, and knights, of whom there was often such a crowd, both foreign and from his own realm, that one could scarcely turn around…There he received news from all sorts of places, perhaps incidents and details of his wars, or the battles of others, and all such matters; there he arranged what should be done according to what was proposed to him, or promised to solve some matter in council, forbade what was unreasonable, accorded favors, signed letters with his own hand, gave reasonable gifts, promised vacant offices, or answered reasonable requests. He occupied himself with such details as these for perhaps two hours, after which he withdrew and retired to rest for about an hour. After this rest period, he spent a time with his most intimate companions in pleasant diversions, perhaps looking at his jewels or other treasures. He took the recreation so the excessive demands on him would not damage his health, because of his delicate constitution, in view of the fact that he spent most of his time busy with demanding affairs. Then he went to vespers, after which, if it was summertime, he sometimes went into the gardens where, if he was in his Hotel of Saint Paul, sometimes the queen would join him with their children. There he spoke with the women of the court, asking news of their children. Sometimes he received curious gifts from various places, perhaps artillery or other armaments and a variety of other things , or merchants would come bringing velvet, cloth of gold, and all sorts of beautiful, exotic objects or jewels, which he had them show to the connoisseurs of such things among members of his family. In winter, especially, he often occupied himself by having read aloud to him fine stories from the Holy Scriptures, or the Deeds of the Romans, or Wise Sayings of the Philosophers, and other such matters until the hour of supper, where he took his place rather early for a high meal. After this, he spent a short period in recreation with his barons and knights before retiring to rest. In his recent article, “Politics or Leisure? 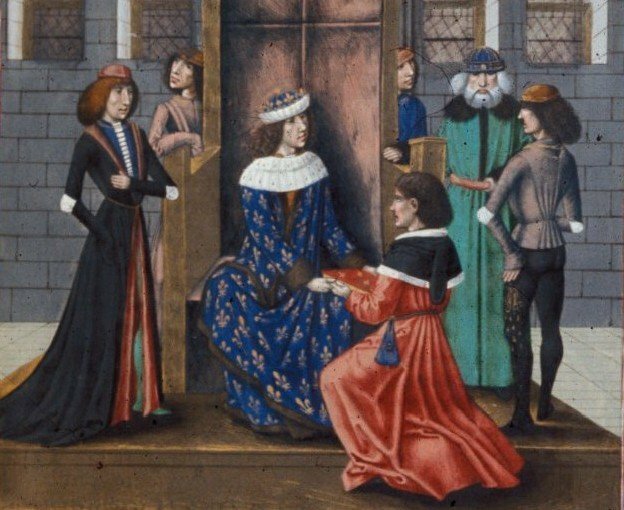 A Day in the Life of King Charles V of France (1364-80)”, Michael Brauer takes a detailed look at this text as well as examining the palaces of the French king to see what light they might shed on his daily activities. He notes that in his homes like the Louvre the king had a series of semi-secret corridors and staircases that would allow him to move around the building without being seen. This would allow him to remain out of public sight when he deemed it necessary. The reason behind this procedure was not so much to correct the deficiencies of a pre-modern society—from the point of view of the modern administrative state, only a fraction of the problems can be solved if the head of the state handles them in person—but to communicate justice to the subjects. The message would be as follows: Justice is possible, the king is acting ad hoc like the wise King Solomon; he is the highest judge of the kingdom and yet still takes the matters of his lowest subjects into his own hands. Christine de Pizan wanted her readers to envision the daily routine of Charles V as being divided into three parts: prayer and study, affairs of the kingdom, leisure and recreation. In her view, the different elements must have formed a unity. A guiding idea of this daily routine is the balance of opposites which reminds one of the assumptions of dietetics, an important strain of thought during the later Middle Ages… By conducting his life following a rigid order, Charles V not only stimulated his health, but gave an example for a—in a wide sense—political life. While single elements (such as rest and leisure) can hardly be called political, taken together they form an order of life. By way of analogy, Christine de Pizan explains that an ordered life is an essential condition for any form of ruling: ‘Political science, supreme among the arts, teaches man to govern himself, his family and subjects and all other matters according to a just and appropriate order. Likewise, it is to be the discipline and the instruction to govern kingdoms and empires’. You can read parts of Livre des faits et bonnes mœurs du sage roy Charles V in English translation in The Writings of Christine de Pizan, edited by Charity Cannon Willard (Persea Books, 1994). The article, “Politics or Leisure? A Day in the Life of King Charles V of France (1364-80)”, by Michael Brauer, appears in The Medieval History Journal, Vol.18:1 (2015). See also: Is it medieval or mediaeval?